We’re finally getting real photos of second versions of Christmas YAHs from last year as You Are Here Christmas London was spotted today on eBay. As I told earlier, lines are solid instead of dotted and I don’t really see any other difference. Well, lines alone make it “different” and valuable for collectors. As usual, I suggest to buy the previous version as it is evident it wont be released again. This also looks as if it is silver, rather than gold, which I find disappointing if true. The gold looks much more Christmas-y to me. I am sure this is just the bad picture. See other Christmas releases from this season. They are really Gold, similar to PPM and Hawaii! 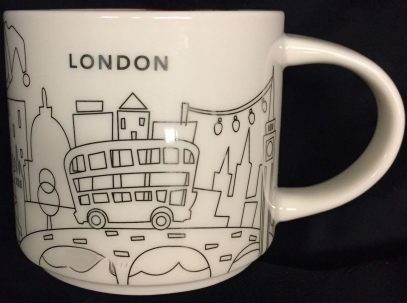 I wonder whether this version will be back again for Christmas 2018 as they just ‘disappeared’ from the shelves of stores early in the new year; in pervious years any unsold items have been sold off at a reduced price but these mugs I didn’t see any at reduced prices. Hello ESXneil. I really doubt these will be back. Based on my experience these are one time thing.